USB Disk Storage Format Tool V5.0 is a free USB flash disk format utility designed by authorsoft Website .USB disk storage formatter v5 support format flash drives with low level and high level format such as "FAT, FAT32, exFAT, or NTFS partition types .USB Disk Storage Format software V5.0 provides quick and save format for your corrupted USB stick . 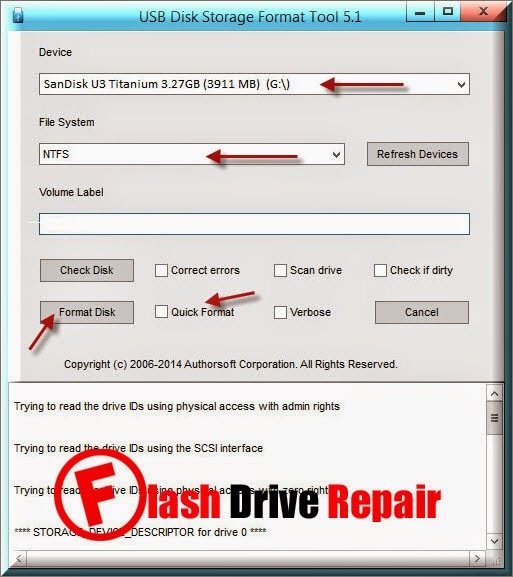 You can use USB Disk Storage Format Tool with flash drives that have format errors and also can delete spaces and partitions that can't be deleted an erase all data on your flash disk .USB Disk Format Tool v5.1 allows you ro remove infected and malicious software inside flash drive .USB Disk Storage Format Tool v5.1 can fix partition errors and bad sectors , also you can scan you flash drive before formatting process .USB Disk Format Tool v5.1 can create a big FAT32 partitions larger than 32 GB . CF Card II ,Memory Stick Duo PRO,SDHC,SDXC and compact Flash . Successfully recovered the following flash drive type "Sandisk flash drive ,Kingston flash drive ,Transcend flash disk ,corsair custom flash drives ,HP thumb drives ,Sony USB stick,Lexar promotional Flash disk ,Imation custom drives ,Toshiba pendrives ,PNY usb drives ,ADATA flash disk and other flash drive brands . 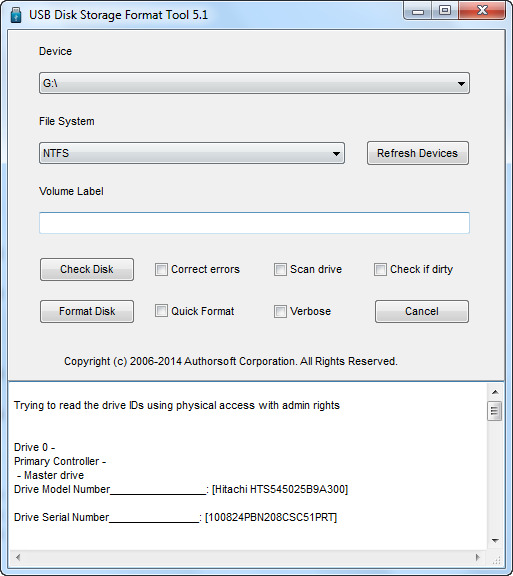 Download USB Disk Storage Format Tool V5.0.rar from the download links below . Insert corrupted USB flash disk to your computer USB port . Extract USB Disk Storage Format Tool V5.1.rar and open USB Disk Storage Format Tool 5.0.exe and install the software on your PC. As you see in the previous picture , choose your flash drive then choose the format type NTFS or FAT32 . Click Quick format or choose any other option as you want to do with your flash . Note that i can't guarantee that this software work with your flash disk so please if it work with your flash , please write the information of your flash in a comment . There is A newer version of USB Storage format tool , you can download it also if you like form here " USB Disk Storage Format Tool V5.3 " . Thanks. Works great on Patriot 32GB HC Class 10 with can not access to card error.